Most of us who live in the North and the West consume far too much – too much meat, too much fat, too much sugar, too much salt. We are more likely to put on too much weight than to go hungry. We live in a society that is heading for a crash. We are aware of what is happening and yet we refuse to take it fully into account. Above all we refuse to address the issue that lies at the heart of our problems – namely, the fact that our societies are based on an economy whose only goal is growth for growth’s sake. 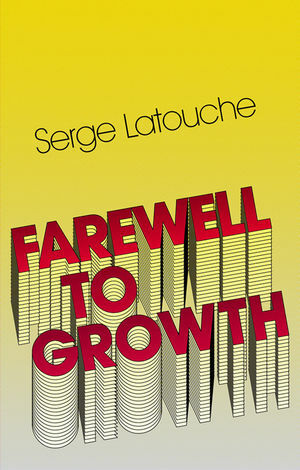 Serge Latouche argues that we need to rethink from the very foundations the idea that our societies should be based on growth. He offers a radical alternative – a society of ‘de-growth’. De-growth is not the same thing as negative growth. We should be talking about ‘a-growth’, in the sense in which we speak of ‘a-theism’. And we do indeed have to abandon a faith or religion – that of the economy, progress and development—and reject the irrational and quasi-idolatrous cult of growth for growth’s sake. While many realize that that the never-ending pursuit of growth is incompatible with a finite planet, we have yet to come to terms with the implications of this – the need to produce less and consume less. But if we do not change course, we are heading for an ecological and human disaster. There is still time to imagine, quite calmly, a system based upon a different logic, and to plan for a ‘de-growth society’. Serge Latouche is Professor Emeritus at the University of Paris-Sud. Is Reducing Growth a Retrograde Step? Is De-Growth Reformist or Revolutionary? Is De-Growth Soluble in Capitalism? Is De-Growth a Right-Wing Policy or a Left-Wing Policy? Do We Need a De-Growth Party? "I would like to use the opportunity of this review to urge readers to take up Latouche's remarkable book." "This little book is a pleasure to read. It is critical, contrarian, informative and provocative. Latouche advances a coherent set of proposals for reversing the treadmill of an ever-more insistent growth dynamic in favour of a more serene existence based on quality of life, solidarity and respect for the environment."